Begin your St. Louis vacation beneath the iconic Gateway Arch and discover a diverse city of Lewis and Clark, beer brewing, inexpensive family attractions and art of every ilk. Book a St. Louis hotel and let the adventure begin. St. Louis has character and style in spades, and that’s reflected in its diverse districts and its range of hotels. From glittering palaces on the vibrant riverside area of Downtown, to budget hotels in the busy commercial district of Westport, St. Louis has something for every budget. Just like its shopping scene, it also has a good proportion of independent hotels to rival the big names, so enjoy finding your spot in this exuberant city. Shopping in St. Louis is a constantly surprising experience. For market lovers and vintage hunters, the whole city is a playground of independent shops, creative collectives, and arty boutiques. Big brands and top designer labels can be found too, but generally they’re kept safely contained in the large, glitzy malls, while the streets of St. Louis are wild with specialty shops and start-ups. Indulge your curiosity and come bargain hunting in this feisty city. 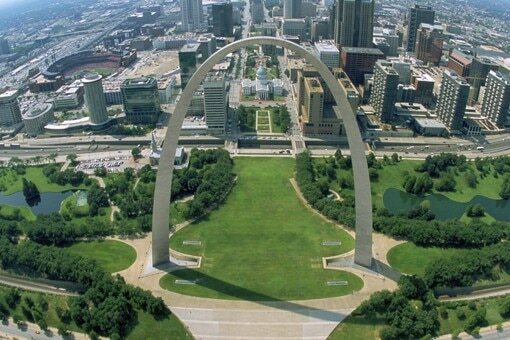 Beneath the grandeur of Gateway Arch, St. Louis is a hugely attractive and culturally diverse city. It’s proud of its frontier heritage, but playful with its museums. It’s a passionate sports city and an old romantic. Look at St. Louis from a different angle, and a new facet sparkles. Best of all, many of its top attractions are free or cheap to visit, so you can have a packed city break on a small budget. A cuisine built on soul food and heavily influenced by the dishes early immigrants from Italy and Asia brought with them, St Louis sure tastes good. Neighborhoods are practically marked out by the dishes they serve up – The Hill is pure-blood Italian, while South Grand is a melting pot of ethnic restaurants, and Midtown is Midwestern comfort food. Forget the diet, loosen your belt and get ready to try all of St Louis’ smoking flavors.